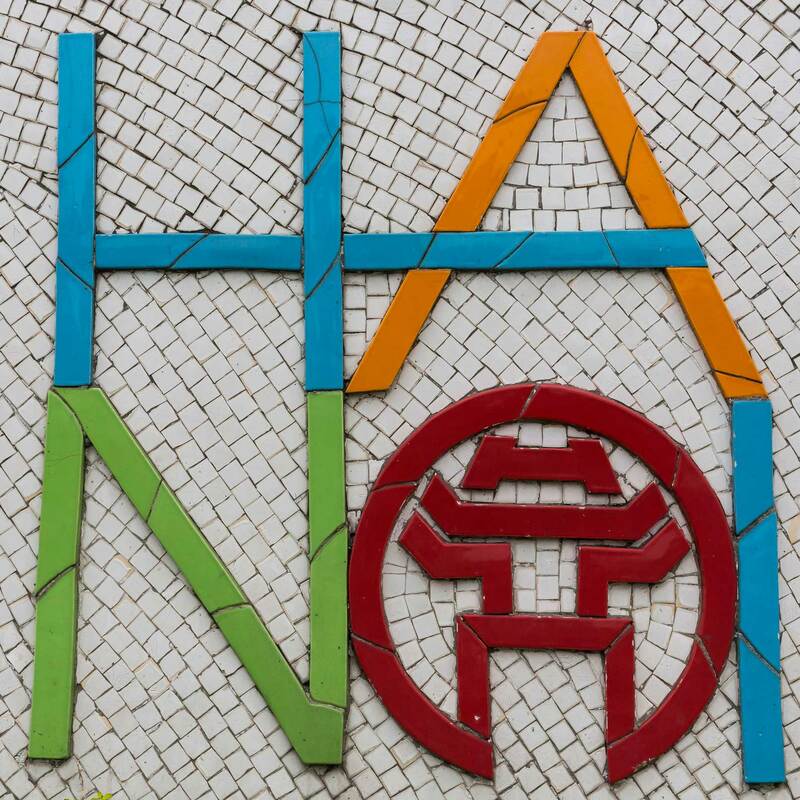 The heart of Hanoi is the Old Quarter that surrounds Hoan Kiem, the ‘lake of the sword restored’. A stroll around the lake before breakfast is a good way to start the day in this vibrant city. 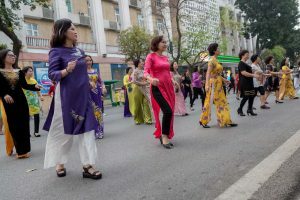 Here, ladies dressed in flowing áo dài partake in lighthearted group workouts to the sound of Boney M’s ‘Brown Girl in the Ring’ and other 70s hits while more serious westerners jog the lakeside path with focused determination. A focal point for city life, the streets around the lake are pedestrianised every Saturday and Sunday – although the usual swarm of motorcycles is replaced with large motorized cars, tanks and emergency vehicles driven children. It’s a delightful family scene, and just one of numerous weekend activities here for youngsters. 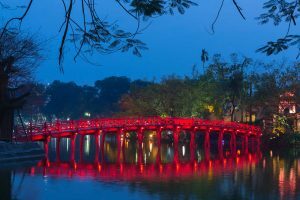 For adventurous travelers, Hanoi is all about street food, open-fronted shophouse restaurants, cool cafés and bars. 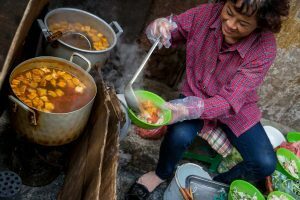 Step outside your hotel at dawn and vendors are already firing up charcoal braziers, setting out ankle-high plastic stools, and laying tables with chopsticks, condiments and tissues. 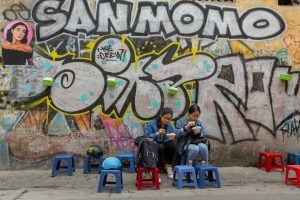 There’s no need for recommendations here; eating in Hanoi is all about wandering the warren of streets and alleyways in the Old Quarter and stopping to feast on freshly cooked fare wherever the fancy takes you. There’s crusty baguettes warmed over charcoal and stuffed with herb-rich omelette, bahn cuon rolled steamed rice noodle sheets with pork or chicken, cha ca fried fish in a noodle soup, the Hanoi mainstay of bun cha grilled pork balls with fermented rice noodles, herbs and a sweet spicy dressing, and of course pho noodle soup, and the ubiquitous bahn mi pâté, pork and salad baguette. 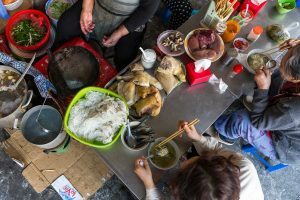 Fresh food, along with plenty of breakfast vendors and restaurants, can be found in and around Dong Xuan, one of Hanoi’s most colourful markets. 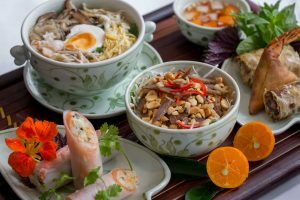 For a more contemporary take on Vietnamese cuisine, head to Spices Garden within Sofitel Legend Metropole Hanoi. Here, Executive Sous Chef Nguyen Thanh Van creates exquisite authentically flavoured dishes served with artistic flair. The first Vietnamese woman to become a member of l’Académie Culinaire de France, Chef Nguyen elevates local cuisine with standout dishes such as grilled Quy Nhon baby lobster with passion fruit sauce, spinach, and baby vegetables from Dalat. Spices Garden is open daily for lunch and dinner. There’s also a barbecued dinner every Saturday evening. Traditionally, Hanoians are tea drinkers but in recent years a still burgeoning coffee scene has emerged. 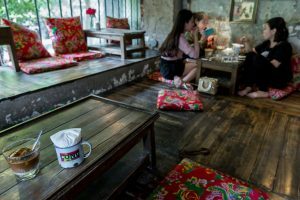 Tapping into the trend for nostalgia and rustic interiors is Cộng Cà Phê. The franchise has 17 venues across the city, including one overlooking St Joseph’s Cathedral. 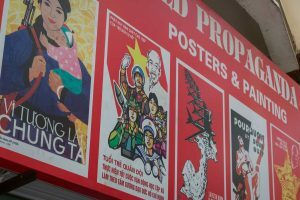 Its military themed and propaganda décor is a big hit with visitors. Locals, however, opt for Aha and branches such as the one at 92C Nguyen Huu Huan are always packed. To sate your thirst after a long day exploring, search out a Bia Hoi joint. Located throughout the city, these no-frills bars are an institution and serve freshly brewed low alcohol beer for less than half a dollar a glass. Hanoi offers an almost limitless selection of hotels for all budgets. For convenience, culture and nightlife choose a property in the Old Quarter close to Hoan Kiem. Hanoi Capella Hotel on 40 Lo Su Road, just a couple of minutes from the north-end of the lake is a great example. 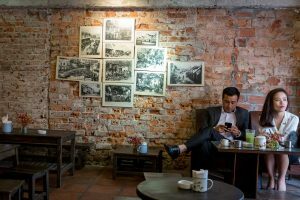 What makes Hanoi’s mid-price hotels standout are extremely courteous, helpful staff, most of whom speak flawless English. Visit hanoicapellahotel.com. 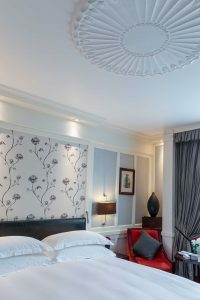 For those looking to experience luxury and a touch of colonial era grandeur, there are two standout hotels, the iconic Sofitel Legend Metropole Hanoi where Graham Greene wrote The Quiet American and now has a luxurious suite named after him, and the nearby Hotel de l’Opera Hanoi. 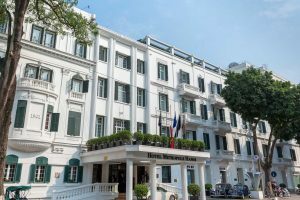 The city’s most prestigious address for more than a century has been Sofitel Legend Metropole Hanoi. The grand old dame of Hanoi manages to retain the grace, ambience and romanticism of the Golden Age of travel in the 20s and 30s when guests included Somerset Maugham who spent a year here writing Gentlemen in the Parlour about his travels throughout Southeast Asia, and Charlie Chaplin who spent his honeymoon here in 1936 after marrying Paulette Goddard in Shanghai. Today, the 364-room hotel features the historic Metropole wing which was inspired by classic French architecture, and the more recent addition of the contemporary Opera wing. An essential part of any stay at the hotel is a free tour known as the Path of History and Bomb Shelter Tour. 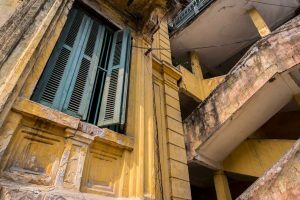 Passionately delivered by local historian, the 45-minute tour provides insight not only about the hotel’s fascinating heritage but also reveals little known facts about Hanoi. It ends with a visit to the Metropole’s own bomb shelter which protected guests such as Joan Baez and Jane Fonda from air raids during the American War 1964, after which it was sealed off. Remarkably, it was forgotten about and only rediscovered by chance during renovations of the Bamboo Bar in 2011. 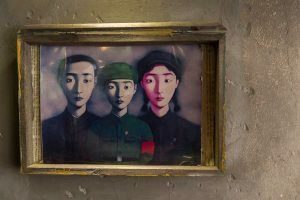 The tours are offered exclusively for guests of the hotel, daily at 5 p.m. and 6 p.m.
Hotel de l’Opera Hanoi is an MGallery hotel, one of a collection of hotels noted for their individual design, sense of place and history. 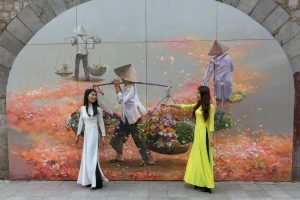 The hotel is in downtown Hanoi, a short distance from Hoan Kiem lake and the imposing historic Hanoi Opera House from which it draws inspiration. 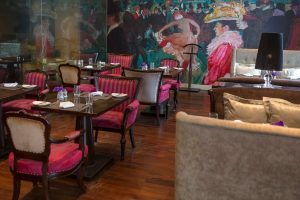 A theatrical theme runs through the hotel; from chic styling of the 107 rooms and suites, to décor at the Mediterranean restaurant, Café Lautrec, and cool bar, La Fée Verte (the Green Fairy) where you can enjoy light snacks and sip signature Absinthe cocktails while at live jazz band plays.